In 2014 supply, repair and field service specialist, CP Automation has seen a record level of applications in which its range of harmonic filters, including the active dynamic filter (ADF) range is required. The number and capacity of drives used in plant applications is increasing and with it rising levels of harmonics are beginning to play havoc in industry. The most common problems caused by harmonic currents include extreme stress on the electrical network, deterioration of the supply voltage quality and damage to equipment, all resulting in higher operating costs. The powerful filters have a reduced footprint, which makes them perfect for ensuring power quality in office buildings, data handling centres, the mining industry, chemical plants and in any other industrial application where drives and motors are present. To ensure these issues are avoided and the power quality in industrial environments remains optimal, active harmonic filters could be used. Comsys’ ADF series can handle any loss-creating behaviour in real time. “We can’t stress enough how much of a positive impact the right harmonic filter can have on a company’s environmental performance, lowering energy consumption and improving productivity,” enthused John Mitchell, CP Automation’s business development manager. “The industry still suffers from a piercing lack of awareness when it comes to harmonics; so working with a professional partner that takes the time to understand and evaluate your application before recommending a solution is crucial”. 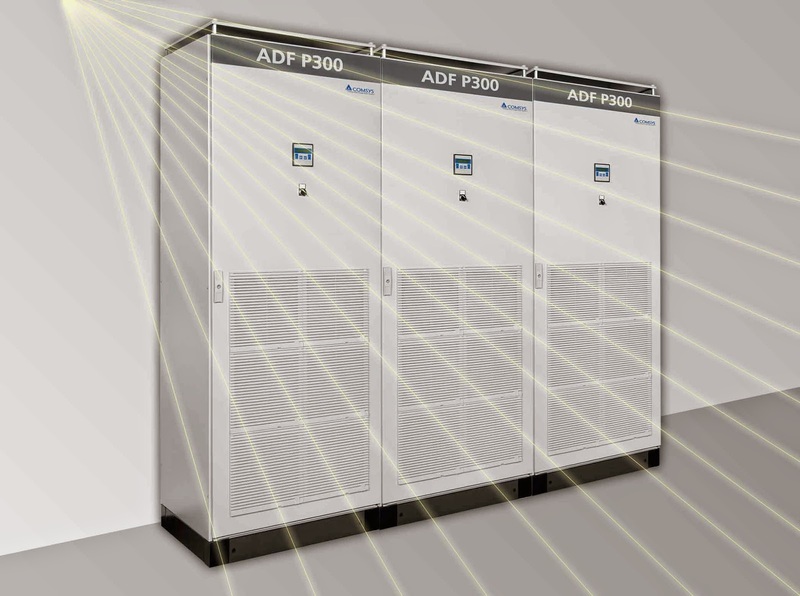 The ADF series has a small footprint and a high power density, which makes it perfect for small and medium size commercial and industrial applications where space is precious. The highlights this year are a 4 wire 100A unit, UL Certified models and increased power ratings by 20 per cent with new cooling techniques. A liquid cooled version of the harmonic filter range is also available, allowing a significant increase in power. The modular design of the Comsys active harmonic filters allows sections to be removed and replaced without the need for a plethora of connectors and cables. This makes the product quick and easy to install, without having to shut down the operation. They lack of cables also makes the product simple to maintain, while significantly reducing costs. If, for any reason, one of the power modules has a fault, the user can shut it down, while continuing to run the active filter in reduction mode. This will keep plant harmonics low, while allowing time for the necessary maintenance.